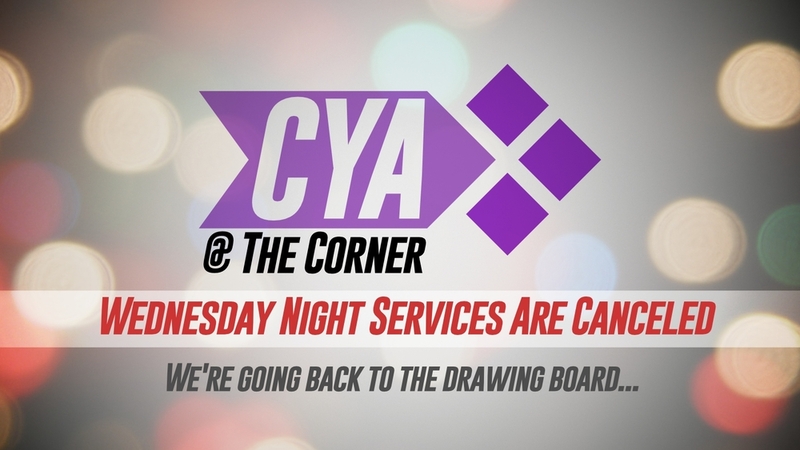 Wednesday Night CYA services canceled; new Saturday services to be announced. When things are going 'okay' it's hard to see need or opportunities for change. Our Wednesday Night young adult services have been going 'okay', but we know there is definitely room for improvement! We're going back to the drawing board to design a service that better reaches young adults. Above all, it's about making Jesus' name greater in the hearts and minds of our young adult community. We're not throwing everything out— we're putting together a team to look at our services, see what works and what doesn't. Then, prayerfully, and purposefully, we'll set out on a new path. We're going to try Saturdays at 5pm... That's all we know for now— we don't even have a start-date yet. And if that doesn't work, we'll try something different. I'm looking forward to what God has in store for us in this ministry.